We recently interviewed Rachel Seavey. Rachel founded Collector Care when she discovered her passion for those with hoarding disorder. She helps others shed their emotional and physical clutter. Rachel’s media appearances include the Emmy-nominated A & E series Hoarders, the CBS Sunday Morning Show and The Lady Brain Show. Rachel also hosts “Hoardganize” a popular organizing podcast for listeners struggling with organization. She is fluent in Spanish and loves to travel. When she is not de-cluttering, extreme cleaning, or blogging, she’s with her son, dogs, and bearded dragon – living life and having fun. I have taken most of my training through The ICD (The Institute for Challenging Disorganization). What percentage of your clients do you suspect have hoarding tendencies? 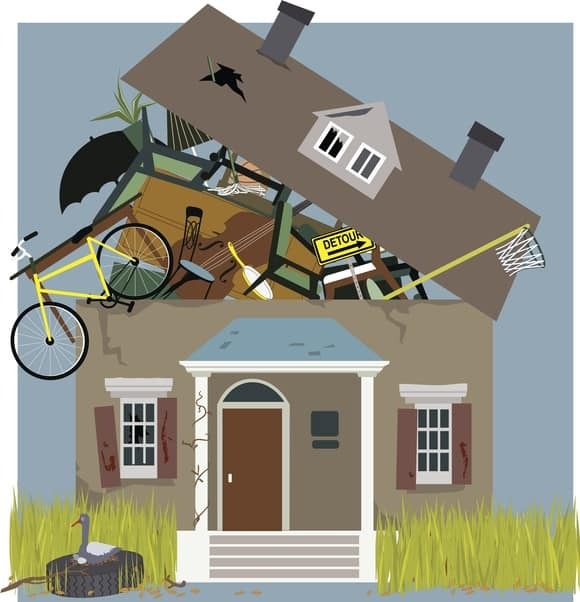 While a lot of the clients I work with have characteristics of hoarding, I believe only about 25% are true hoarders. As you start working, are there times when you discover this is something other than hoarding? Yes. It could be an injury that has suddenly made a person less mobile and so less inclined to pick up after themselves, so stuff accumulated or grief that has thrust the person into a depression. Or another clue maybe the level of clutter. What tool do you use to determine the amount of clutter? My team uses the ICD clutter hoarding scale. We keep laminated copies in our trucks and refer to them whenever we have a question. How do you determine if the working area is safe for you and your client? I always make an in-person assessment first. If there is mold, I have that treated first. If there are rodents, I sometimes end up in a catch 22 position. Of course, I want the rodents dealt with first, but some companies will not come out and bate for the rodents until the clutter is cleared. If there is structural damage, I will not put the team in danger. I make sure the damage is fixed before we return to work. Do you usually work alone or with a team? If you work with a team, who do you want on your team? Collector Care uses teams. I have five employees and sometimes subcontract out other NAPO organizers. I insist that everyone has a business license and insurance. Our truck drivers have slightly different qualifications. Do you have different lead organizers depending on the level of the hoard? I fit the lead organizer to the job. Most of the team can do the lead job but if someone is uncomfortable taking a job where there is a level 4 or 5 hoard, I honor that. Would you be willing to share something you learned – maybe the hard way from a client? I have learned to ask about everything that is going to be tossed. Ask, ask, and over-ask. I never assume even if it seems obvious to me and my team. Once early on, the team and I were working in a room without the client. There were a lot of dead plants and dead flowers mixed in with the clutter. They were not on display or even all in one place. We put all of them in our dumpster. When the client came into the room, she was very distressed. Some of those flowers were from her mother’s grave. Eventually the client forgave me, but I never forgave myself. Another time, we were working in a kitchen. There was a vat of used cooking oil right by the stove. We secured it and took it to the dumpster considering it a safety hazard. The client was extremely upset with us and demanded that we retrieve that oil. Apparently, it was a special oil that came from Italy and it meant a lot to her. Our team lost time on the job trying to retrieve that oil. We eventually did find it. Ask, ask, over-ask. What advice would you give someone who is considering going into the field? I would advise them to take the tele-classes offered by ICD. Get all the training you can. I have had organizers volunteer to assist on some of our jobs just so they can see what it is like and so that they can better make the decision if this type of client is for them. They should also be aware that this type of work involves a lot of physical labor. You must be able to work long and hard. Emotional burn out can easily happen so plan for how to handle it if it happens. Do you have a shareable list of resources for people challenged by hoarding or their families? The ICD website has many resources. I also really appreciate Judith Kolberg’s books on hoarding, chronic disorganization, and ADD. You can find them on her website. Do you have any books or articles you have written that you would like to share? I would love to share my podcast series and my blog on my website. Thank you very much for this fabulous time spent together learning more about the work you do. If you are or if you know a professional who works with people with hoarding tendencies, please feel free to get in touch with us. We’d love the opportunity to talk with you, too! Jonda S. Beattie is a Professional Organizer and owner of Time Space Organization based in the Metro-Atlanta area. As presenter, author of three books as well as a retired special education teacher, she uses her listening skills, problem solving skills, knowledge of different learning techniques, ADHD specialty, and paper management skills to help clients tackle the toughest organizational issues. Jonda does hands on organizing, virtual organizing, and moderates a Zone Plan Teleclass for those who prefer to work on their own with organizational coaching.